Just as we all have tried. Tell me when you love me best?" And I told you all the day. For I love you all the time." That you will not deny. "Do you best love me?" He made the same reply. Halfway through ACT I of The Wizard of Oz Sir Dashemoff Daily, the Poet Laureate of Oz, sings a love song about his true love--who happens to be Dorothy Gale. L. Frank Baum and Paul Tietjens had written a wonderful song for the spot called Love is Love. But every once in a while the actress playing Sir Dashemoff wanted to try something new. 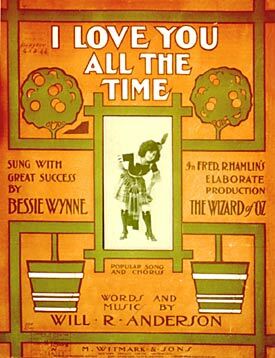 One of the first songs to be tried out was I Love You All the Time by Will R. Anderson. You can listen to it by clicking on the record label below. Listen to this 1904 recording! The role of Sir Dashemoff was created by a fine singing actress named Bessie Wynn. She made a specialty of these "trouser roles" and went on to create the role of Tom Tom in Victor Herbert's Babes in Toyland immediately after leaving Wizard. Eventually, despite many other substitutions, Baum and Tietjens' song, Love is Love, was reinstated. But go ahead and enjoy this charming interpolation as sung by Harry Macdonough back in 1904. You can also print copies of the sheet music for yourself by clicking on the links below.